Lone Star Circus: A Celebration of Love and Imagination! I recently had the pleasure of interviewing Fanny Kerwich, founder and Creative Director of Lone Star Circus, a unique circus show that features international stars who come together once a year, during the holidays, to entertain Dallas audiences with their exciting performances. And it all started with two people falling in love! Fanny happened to be touring with a show in Dallas several years ago when she met her then future husband Mark Doyle. Mark is an attorney so it took a while for Fanny to say “yes” because circus folk usually don’t marry non-circus folk. True love won out, however, and the couple has been married 10 years. Fanny and Mark live in Dallas with their 5-year-old daughter Gitana and their 4-year-old son Garrett. Fun Fact: Fanny says that everyday is a circus at their home. Her children enjoy practicing trapeze arts, balancing on a walking ball and performing with aerial silks! As an 8th generation circus performer, Fanny has circus in her blood. She is the daughter of Albert Kerwich, a renowned aerialist and circus entrepreneur in Canada. Fanny’s mother was also a circus performer and did a balancing act in the family show. It’s tradition to have children be part of the show at a young age so Fanny started training on the trapeze at age 4 and began professionally performing in her parents’ show at age 6! Fanny also studied circus arts at the National Circus School in Paris and later studied in Moscow under legendary circus act director Valentin Gneushev. 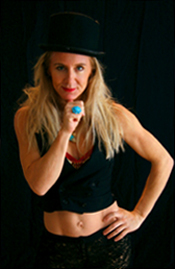 A highly versatile circus star, Fanny has performed as an acrobat, aerialist, contortionist, and clown. She has also thrilled audiences with her remarkable hula hoop act. When Fanny married Mark, leaving her beloved circus life behind just wasn’t an option. Fanny’s love and passion for the circus inspired her to start what is today known as the Lone Star Circus. In its 5th year, Lone Star Circus has a loyal following and has become part of the Dallas culture as a traditional holiday season must see family event! This year, Lone Star Circus presents Cirque Banquiste, a spectacular production with performances by international circus superstars. Adorned in a montage of dazzling costumes, acrobats, aerialists, hand balancers, contortionists, jugglers, and clowns perform together to create a sensational circus extravaganza! The show will also feature a performance by the canine antics of Luciano Anastasini’s playful dogs. 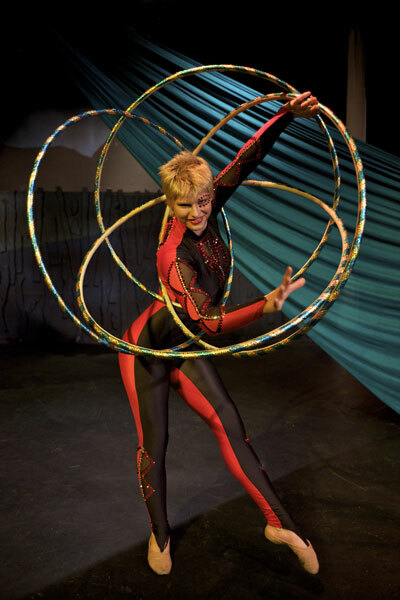 One of the acts that my daughter is really looking forward to seeing is Raphaele Daubois and her twirling hula hoops. We got to see Raphaele perform at the North Texas Kids Family Expo in November during a preview of Lone Star Circus. She was amazing and had a multitude of hoops swirling around her at one point! Raphaele has been a student at the Lone Star Circus School for about seven years and is one of two student performers in Cirque Banquiste. The brief preview we saw at the Expo was fantastic so I can only imagine how awesome the full show will be! Can’t wait to see it! The Lone Star Circus School offers year-round classes for adults and children, including after-school programs for kids and core fitness classes for adults, and provides training in traditional circus acts for all ages. The school also provides circus-themed entertainment for the community, including corporate and civic events, and for fundraising events for other non-profit organizations. Fun Fact: The Lone Star Circus School students have performed during halftime at Dallas Mavericks games. Because of its intimate theatre setting, Lone Star Circus provides its audience with a chance to enjoy a theatrical and artistic performance up close. Before the show, attendees get to enjoy pre-show festivities and performances from highly skilled students of the Lone Star Circus School. Kids can also have fun trying their hand at circus skills like juggling. After the show, attendees have a chance to meet and visit with the show stars who are available to sign autographs and take pictures. This special treat is part of the unique and welcoming experience of Lone Star Circus! Lone Star Circus is playing at the Rosewood Center for Family Arts for only 6 shows from December 29th through January 1st so don’t miss your chance to experience this exciting family event. Ticket prices range from $20 – $45. Use the discount code LSC and get a 10% discount! Tickets are available at www.lonestarcircus.org or by calling 214.740.0051. For group sales information, contact Mark Doyle at markdoyle@lonestarcircus.org or 214.237.2515. Mina Frannea is a web editor and social media professional. She enjoys the Arts, cooking, enlightening discussions and sharing relevant information with other Moms. A Mom to nine-year-old twins, Mina enjoys writing about family friendly activities around town, theater performances, favorite recipes and activities that keep her children busy and happy. Visit Mina’s blog at www.themomsjournal.com.